Usurpation of symbols and slogans. 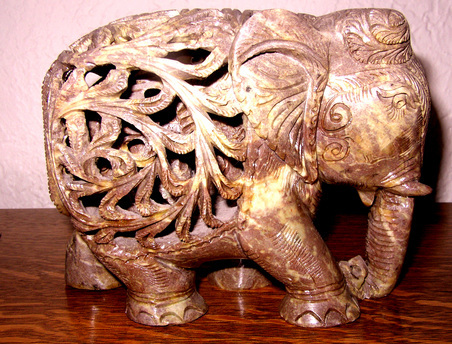 I love elephants and have quite a collection of them though I can only think of two which were not gifts from one of the 400 international adults we've hosted in our home since 1980. 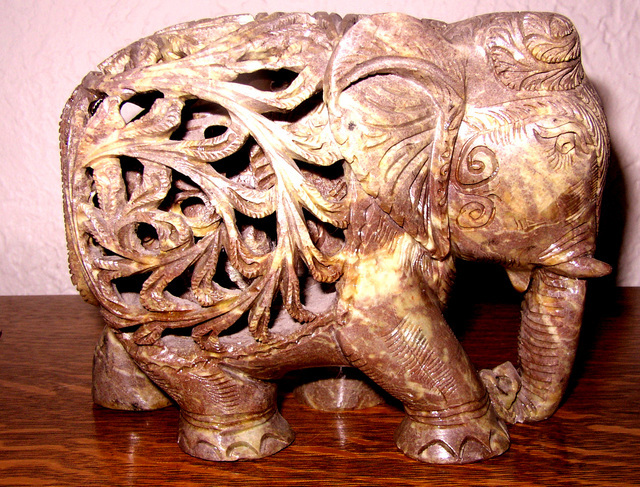 The one above, brought to me from India by my husband, is actually three elephants carved from one piece of stone. Some of my favorites are elephant jewelry but I rarely wear them because elephants have been co-opted by an ideology I strongly disagree with. When we were younger, we always put out the American flag on Flag Day and Independence Day. Then in the late 60s the "love it or leave it" crowd began to paste flags, along with that slogan, in the back window of their vehicles. And more recently, patriotism has become associated with religious fanaticism. I just cannot figure out what is appropriate about playing religious songs during the 7th Inning Stretch of baseball games. I am patriotic, love our country and support our troops. I still stand, honor the flag and proudly sing the Star Spangled Banner to begin the game. However, I usually go for ice cream when God Bless America or America the Beautiful is sung between the top and bottom halves of the seventh inning and, sadly, we no longer fly the flag at our home. I used to pride myself on being "fair and balanced." Now even that pronouncement comes with a paragraph of disclaimers. What I continue to do, however, is hold fast to multiple options instead of "either-or" dichotomies, advocate the scientific method for determining the soundness of scientific claims, and support research on problematic social issues in order to find viable solutions--not to produce topics for political propaganda and/or financial gain. I am thankful that no offensive cause has yet commandeered any of my favorite symbolic birds, the corvids (crows, magpies and jays), as its mascot. I suppose crows are too in-your-face and raucous for most organizations, certainly not appropriate for a political organization catering to the corporate elite. I receive periodic newsletters from the Red Poppy which is a group celebrating Pablo Neruda's life and writings--and also has a progressive populist political leaning. Today the newsletter featured this poem which represents my views on this inauguration day. For me it is a sad day for our country. I hope our country can survive four more years of mismanagement, deception and greed. "The United Fruit Co." . We left Chile two days before the Asian Pacific Economic Conference began.and four days before 30,000 people in Valparaiso protested against President Bush and his policies. During the entire week prior to the conference we saw highly visible beefed-up security everywhere. As if Bush and his policies hadn't already sufficiently tarnished the reputation of Americans around the world, his official tantrum demanding that all other heads of state go through a metal detector before he would attend the official APEC gala and dinner in his honor was the final embarrassment. Kudos to Chile's President Lagos for making a stand and canceling the entire affair and letting the world know why. A platoon of Chilean security had blocked his lead agent from following him into a dinner when the president, who had been posing for photographs with wife Laura Bush, noticed the shoving match, doubled back, reached into the scrum, and pulled the agent out. Television cameras caught the US leader shaking his head and adjusting his shirt cuffs after the incident. The White House later made light of the incident with spokesman Scott McClellan joking: "The president is someone who tends to delegate, but every now and then he's a hands-on kind of guy." Chilean officials also downplayed the glitch as an isolated "minor incident" but on Sunday another security squabble, this one over US plans to run the 400 guests at a banquet in Bush's honor through a metal detector, led Chile to scrap the feast and replace it with a 20-person working dinner. "I won't let them do that to my guests," Chilean President Ricardo Lagos was quoted as saying by a foreign ministry official. US officials did not dispute the thrust of that account. 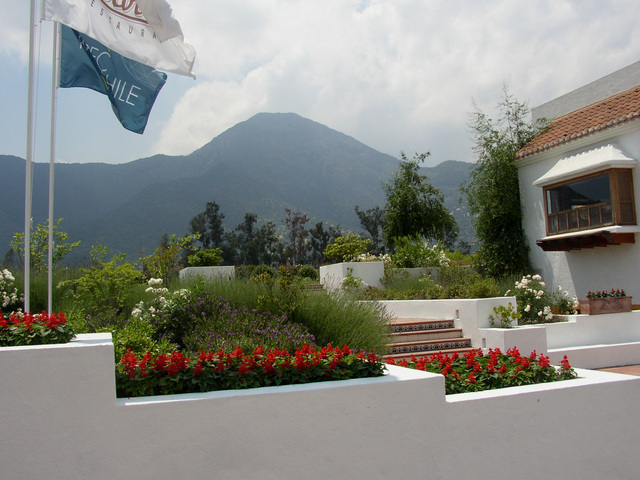 The incidents were covered in detail by leading US newspapers, including a front page story in the Washington Post, and the New York Times reported that Chilean officials had been appalled by the demands of Bush's security team. "Can you imagine someone like the Chief Justice of the Supreme Court having to submit to an inspection by gringo security agents in order to get into our own seat of government?" the Times quoted one person who had been scheduled to attend Sunday's banquet. "That's an affront no Chilean was going to tolerate, and Lagos had no choice but to act the way he did," the man told the newspaper. The entire article can be read here. Several days later one of my more conservative friends in Chile wrote me in Spanish, "Tu presidente está completamente loco," which translates to, "Your president is completely crazy." Actually Bush may be more aware than I gave him credit for: Perhaps he knows how much he is hated and distrusted around the world and is rightfully paranoid. However, now my foreign friends are asking me, "Why would your country re-elect this man." I just hang my head in embarrassment and say, "I really don't know."